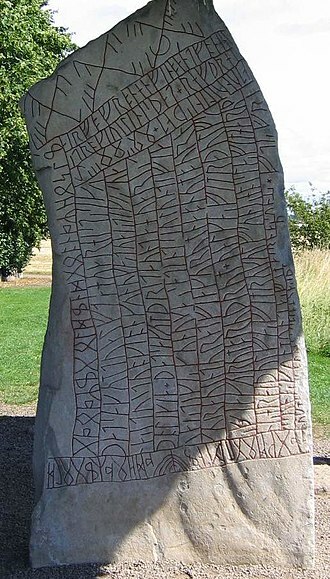 According to John Lindow, Andy Orchard, and Rudolf Simek connections are commonly drawn between the Harii and the Einherjar of Norse mythology; those that have died and gone to Valhalla ruled over by the god Odin, preparing for the events of Ragnarök. 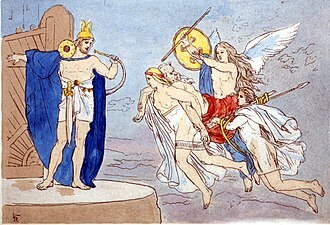 Lindow says that regarding the theorized connection between the Harii and the Einherjar, "many scholars think there may be basis for the myth in an ancient Odin cult, which would be centered on young warriors who entered into an ecstatic relationship with Odin" and that the name Harii has been etymologically connected to the -herjar element of einherjar. Simek says that since the connection has become widespread, "one tends to interpret these obviously living armies of the dead as religiously motivated bands of warriors, who led to the formation of the concept of the einherjar as well as the Wild Hunt". ^ a b Simek (2007:71). 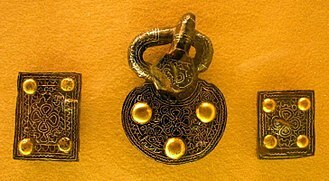 See also discussion on the Odinic name Herjann in Simek (2007:143). 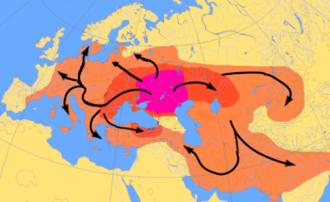 The Bructeri were a Germanic tribe in Roman imperial times, located in northwestern Germany, in present-day North Rhine-Westphalia. 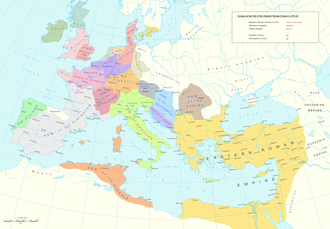 Their territory included both sides of the upper Ems and Lippe rivers, at its greatest extent, their territory apparently stretched between the vicinities of the Rhine in the west and the Teutoburg Forest and Weser river in the east. 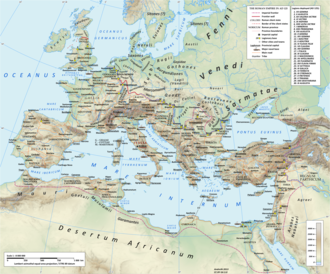 In late Roman times they moved south to settle upon the east bank of the Rhine facing Cologne, six years later, one of the generals serving under Germanicus, L. Stertinius defeated the Bructeri near the Ems and devastated their lands. Among the booty captured by Stertinius was the standard of Legio XIX that had been lost at Teutoburg Forest. The Bructeri in 69-70 participated in the Batavian rebellion, the best known of the Bructeri was their wise virgin Veleda, the spiritual leader of the Batavi rising, regarded as a goddess. 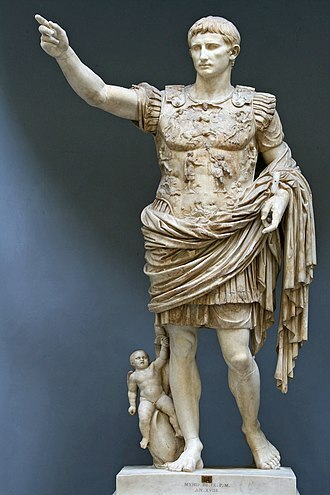 She foretold the success of the Germans against the Roman legions during the Batavian revolt, a Roman Munius Lupercus was sent to offer her gifts but was murdered on the road. The inhabitants of Cologne, the Ubii, asked for her as an arbiter, they were not, however, in order to inspire them with more respect they were prevented from seeing her. She dwelt in a lofty tower, and one of her relatives, chosen for the purpose, like the messenger of a divinity, the Bructeri were sometimes divided into major and minor divisions. 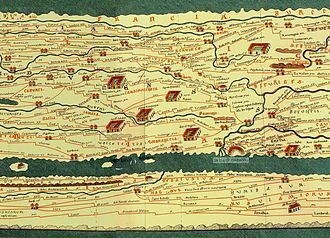 Strabo describes the Lippe river running through the territory of the lesser Bructeri, ptolemy says that lesser Bructeri and the Sicambri occupied the area just to the north of the Rhine. 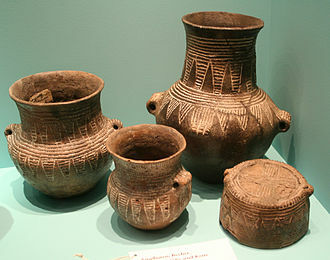 Both authors agree that the greater Bructeri in their time lived between the Ems and the Weser, to the south of a part of the Chauci and this was done by the Chamavi and Angrivarii, who neighbored the Bructeri upon their north, along with other neighboring tribes. More than sixty thousand fell in conflict, which the Romans had been able to observe with satisfaction. 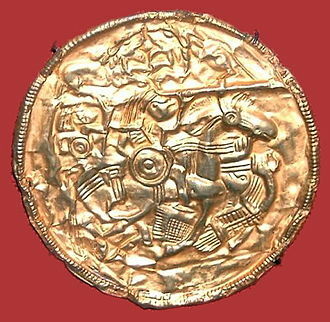 The Bructeri eventually disappear from records, apparently absorbed into the Frankish communities of the early Middle Ages. The Wild Hunt is a European folk myth involving a ghostly or supernatural group of huntsmen passing in wild pursuit. Seeing the Wild Hunt was thought to presage some catastrophe such as war or plague, people encountering the Hunt might be abducted to the underworld or the fairy kingdom. In some instances, it was believed that peoples spirits could be pulled away during their sleep to join the cavalcade. Grimm popularised the term Wilde Jagd for the phenomenon, based on the comparative approach based on German folklore, the phenomenon is often referred to as Wilde Jagd or Wildes Heer. In Germany, where it was known as the Wild Army, or Furious Army, its leader was given various identities, including Wodan, Knecht Ruprecht, Berchtold. The Wild Hunt is known from post-medieval folklore, in England, it was known as Herlaþing, Wodens Hunt, Herods Hunt, Cains Hunt, the Devils Dandy Dogs, Gabriels Hounds, and Ghost Riders. In Wales, a folk myth is known as Cŵn Annwn. In Scandinavia, the Wild Hunt is known as Oskoreia or Asgårdsreia, in France, it was known as Mesnée dHellequin, in Canada it becomes Chasse-galerie. In West Slavic Central Europe it is known as divoký hon or štvaní, Dziki Gon or Dziki Łów, the concept of the Wild Hunt was first documented by the German folklorist Jacob Grimm, who first published it in his 1835 book Deutsche Mythologie. It was in work that he popularised the term Wilde Jagd for the phenomenon. Grimms methodological approach was rooted in the idea – common in nineteenth-century Europe – that modern folklore represented a fossilized survival of the beliefs of the distant past. 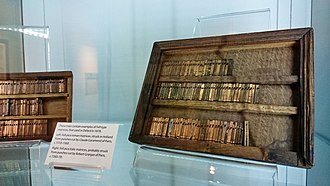 In developing his idea of the Wild Hunt, he mixed together recent folkloric sources with textual evidence dating to the Medieval and Early Modern periods. This approach came to be criticized within the field of folkloristics during the 20th century, as emphasis was placed on the dynamic. Grimm believed that this figure was sometimes replaced by a female counterpart. In his words, not only Wuotan and other gods, but heathen goddesses too, may head the furious host and he added his opinion that this female figure was Wodens wife. In Norse mythology, the einherjar are those who have died in battle and are brought to Valhalla by valkyries. In Valhalla, the einherjar eat their fill of the nightly-resurrecting beast Sæhrímnir, the einherjar prepare daily for the events of Ragnarök, when they will advance for an immense battle at the field of Vígríðr, the battle which the ein refers to. 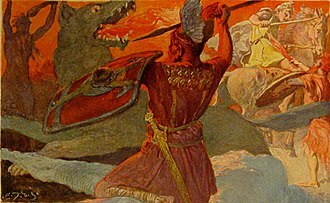 Heimdall occasionally returned the best of Einherjar to Midgard or Jotunheim with the purpose of killing giants, scholarly theories have been proposed etymologically connecting the einherjar to the Harii, the eternal battle of Hjaðningavíg, and the Wild Hunt. 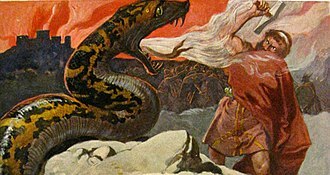 The einherjar have been the subject of works of art and poetry, in the poem Vafþrúðnismál, Odin engages the wise jötunn Vafþrúðnir in a game of wits. 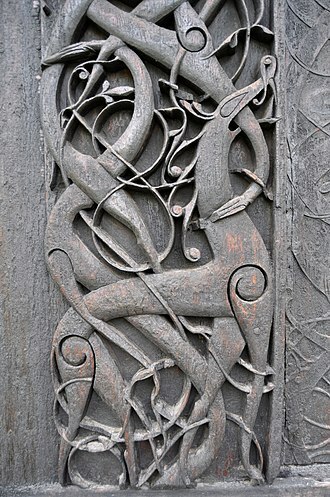 Disguised as Gagnráðr, Odin asks Vafþrúðnir where men fight in every day. 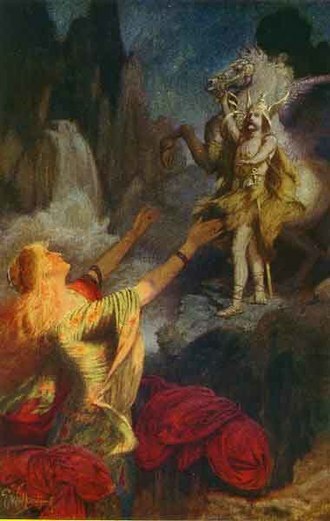 Further into Grímnismál, Odin gives a list of valkyries, in the poem Helgakviða Hundingsbana I, the hero Sinfjötli flyts with Guðmundr. In the Prose Edda book Gylfaginning, the einherjar are introduced in chapter 20, in chapter 35, High quotes the Grímnismál valkyrie list, and says that these valkyries wait in Valhalla, and there serve drink, and look after tableware and drinking vessels in Valhalla. In addition, High says that Odin sends valkyries to every battle, that they allot death to men, in chapter 38, High provides more detail about the einherjar. Gangleri says that you say that all men that have fallen in battle since the beginning of the world have now come to Odin in Val-hall. What has he got to offer them food, I should have thought that there must be a pretty large number there. High replies that it is there are a pretty large number of men there, adding many more have yet to arrive. 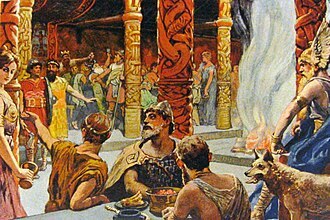 However, High adds that food is not a problem because there never be too many people in Valhalla that the meat of Sæhrímnir cannot sufficiently feed. 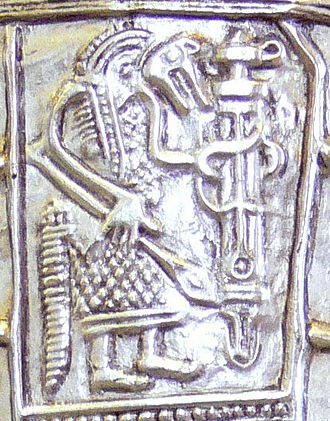 High says that Sæhrímnir is cooked every day by the cook Andhrímnir in the pot Eldhrimnir, High quotes the stanza of Grímnismál mentioning the cook and container in reference. Further into chapter 38, Gangleri asks if Odin consumes the same meals as the einherjar. 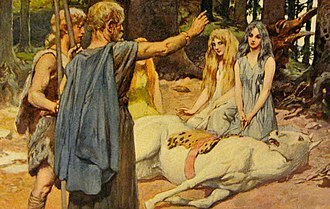 High responds that Odin gives the food on his table to his two wolves Geri and Freki, and that Odin himself needs no food, for Odin gains sustenance from wine as if it were drink, High quotes another stanza from Grímnismál in reference. 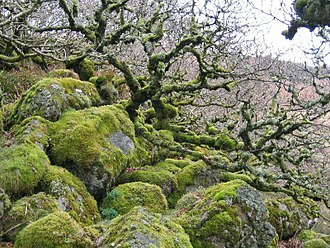 Wistman's Wood in Devon, England.